Home » Wellness » LiveSmart: Eating Well with Diabetes – Think Fresh! Cooking meals can be hard in our fast-paced world. Cooking when you have to monitor and control carbohydrates because of diabetes can be harder. Fortunately, this past October, the American Diabetes Association launched the Diabetes Food Hub (www.diabetesfoodhub.org), a new recipe site geared for those living with diabetes. Each recipe includes nutrition information to help simplify carb counting. 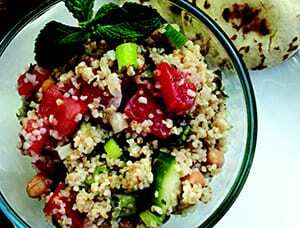 A fresh, delicious example is their Chickpea Tabbouleh. It’s a quick, 30-minute recipe you can add to your repertoire as part of a meal or as a snack! Rinse the bulgur wheat and add it to a small bowl. Pour hot water over the bulgur, cover, and let soak for about 20 minutes, until doubled in size. Drain excess liquid, if any, and place the bulgur in a large bowl. Chop the parsley to a medium-fine consistency. It should have some texture and not look pureed. Add the parsley to the bulgur wheat. Add all the remaining salad ingredients. Cover and set aside. For the vinaigrette, whisk together the lemon juice, olive oil and salt in a small bowl. Add to the salad; taste and adjust any seasonings. Add more lemon juice if desired. Turn the tabbouleh out onto a platter to serve.